Natalija A. & Eva C.
Mind Factory explores a mosaic of ideas and practices currently surrounding the question of cognition, mind, literacy, autopoiesis and tele-technologies, and how these define a contemporary "human condition." 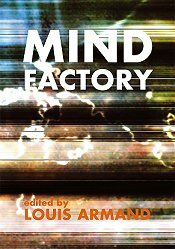 Essays included in this volume address a range of subjects from the Abu Ghraib torture photographs, brain implants and behavioural control, to the possibility of quantum minds and machine intelligence, to the technicity of faith, sintonic desire, ideoplastic materialisation and psychic geographies.